Anyone that's known me long enough knows this is my time of year. When the sun's beating down, the sky's nice and clear, and there's just a little cool breeze. Perfect weather for gettin' the grill out. I prefer charcoal to gas because I like the way it enhances the flavor. And I like putting anything out over the coals. Chicken, brisket, bratwurst, kielbasa, hamburgers, ribs.... If it's tasty, I'll attempt to grill it. I've even peeled the label of of cans of beans and put them on the grill, hehe. It's just the best time and I'm always willing to stand over the glowing coals. It's almost a zen-like experience! Another work from Sparky. I wanted something fun to celebrate the coming season. My favorite season. I don't mind hot weather at all, really. It doesn't bother me. And apparently I forgot my belt! I don't really get grillin myself but that might be because I've never done it, neat picture though. It's fun. Used to do a lot of grillin' with my Dad when I was a kid. So it's just kinda ingrained in me at this point. I never did anything with my dad, I was too afraid he'd scream at me if I fucked anything up. Glad it's good times food you though. Aww, that's sad to hear. 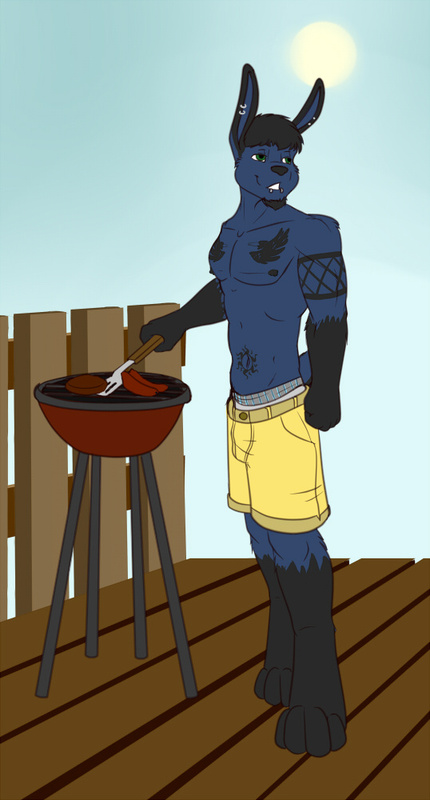 I didn't do too much with my own, but, when there was a BBQ goin' on, it was usually him and his Dad and myself. We all lived right next to each other. It worked out nicely.